The expansion of the residential and commercial construction industries and the growth of the home improvement industry have boosted the demand for drywall textures in the North America. The housing market in the U.S. has been expanding at a steady pace, driven by a low supply of existing homes, higher prospects of jobs, and rise in incomes. According to the U.S. Census Bureau and the Department of Housing and Urban Development, the number of privately owned housing constructions in June 2016 increased by 18.9%. This growth of the housing market has had a positive impact on the North America drywall textures market. The drywall textures market in North America was valued at US$741.1 mn in 2014 and is projected to reach US$1.0 bn by 2024, expanding at a CAGR of 4.5% therein. In terms of volume, the market is expected to register a CAGR of 3.8% during the forecast period. By product, regular drywall and fire-resistant drywall collectively accounted more than half the North America market in 2015. Currently, regular drywall dominates the North America drywall textures market, holding a 37% share in 2015. Regular drywall is used in applications that involve direct mechanical attachment to ceiling frames and metal walls or attachment to surfaces using adhesives. The demand for fire-resistant drywall can be attributed to the implementation of local building codes pertaining to residential spaces in North America. These codes mandate the installation of fire-rated drywall on interior and exterior walls near furnaces and utility rooms. Fire-resistant drywall is also commonly used for commercial and multi-family construction, where fire-rating is required. By texture, knockdown and orange peel collectively accounted for 65% of the North America drywall textures market in terms of revenue in 2015. Knockdown textures are estimated to form the most attractive segment during the forecast period as they are increasingly popular in many towns and cities across the U.S. In terms of volume, the U.S. has been the leading market for drywall textures, followed by Canada. Accounting for 75% of the North America market in 2015, the U.S drywall textures market is likely to expand at a steady pace due to the rising demand for the same in building and construction applications. The demand for regular drywall has been comparatively high in the U.S. market by product and this segment is likely to expand at a steady rate from 2016 to 2024. By mud, topping joint compounds held the leading share in this country-specific market for drywall textures. 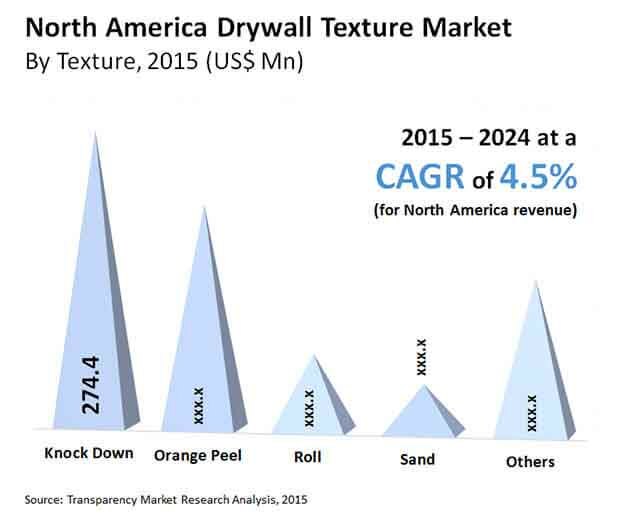 Registering a high CAGR of 4.8% during the course of the forecast period, the knockdown segment of the U.S. drywall textures market by texture is also the most prominent category in terms of revenue. The residential sector in the U.S. has been the leading end user of drywall textures, while walls form the dominant application segment in the country. Key players operating in the North America drywall textures market include Graco Inc., 3M, Knauf Gips KG, The Sherwin-Williams Company, USG Corporation, Artisan Textures and Drywall, Inc., Muddy Boys, Inc, PABCO Gypsum, Hamilton Drywall Products, LS Drywall Inc., and Shikoku International Corporation.